Figure 9. Diagonal-sequence walks on a flat surface: schematic, viewed from above. 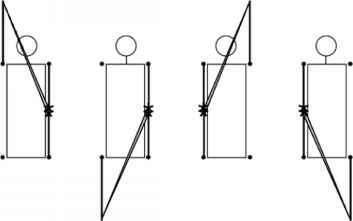 (A) body axis collinear with direction of progression; (B) body rotated to one side through an angle a (without altering direction of progression or plane of limb movement), and stride length increased slightly, producing unilateral overstriding of the forefeet by the hindfeet. 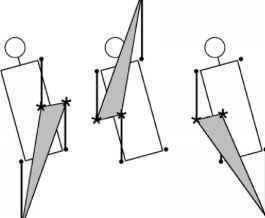 Depending on the size of a and the precise placement of the feet, such overstriding can augment the meager support polygons (hachure) of DS walks by moving the placement points of the two ipsilateral feet (asterisks: "unilateral bipod," Figure 3) further apart during tripedal support phases. the hindlimb must have had a particular and special importance in the locomotor behavior of primitive primates. Harking back to Jones in their initial formulations of their theories about vertical clinging and leaping, Napier and Walker coined the phrase "hindlimb-dominated" to describe ancestral primate locomotion (Napier, 1967; Napier and Walker, 1967; Walker, 1967). This phrase has been in use ever since, but its meaning has been shifting. In 1972, Martin gave the phrase a new meaning when he used it to characterize the locomotor behavior of Microcebus as a model ancestral primate. Originally, Martin seems to have been thinking about the use of the hindlimb in leaping—among horizontal as well as vertical branches—and in supporting the body in cantilevered postures when reaching for food items. The term "graspleaping," used by Szalay and his coworkers (Szalay and Dagosto, 1988; Szalay and Delson, 1979; Szalay and Sargis, 2001; Szalay et al., 1987), branches off the semantic tree somewhere near this node. In describing primate locomotion as "rear-driven," Kimura et al. 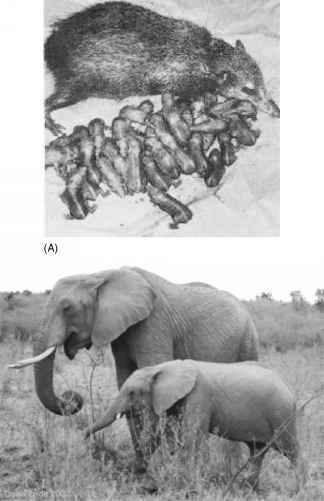 (1979) concluded that primates differ from other mammals in using the hindlimb as the main propulsive organ. They suggested that this has somehow resulted in the evolution of DS walking gaits, and they followed Wood Jones in relating all this to orthograde posture and the freeing of the forelimb for manipulation. Rollinson and Martin built on Kimura's work in arguing that primates have a posteriorly shifted center of mass, and Martin (1990) subsequently incorporated this conclusion into his earlier characterization of primate locomotion as "hindlimb-dominated." We think that all these theories are correct in stressing the distinctive importance of the hindlimb in primate locomotion. The grasping modifications of the primate hindfoot provide additional safety in the trees by offering a secure anchor on a support known to be reliable. Primates modify their locomotor behavior to take advantage of this by shifting weight toward the hindlimb and by increasing hindlimb duty factors relative to those of the fore-limb in walking. This increase in hindlimb duty factors enhances the diago-nality of primate walking gaits, so that the body is more or less balanced over the protracted hindlimb when the forelimb comes down on an untested support. These points are demonstrated facts. Our interpretation of these facts, which is subject to debate, is that these primate traits make sense as adaptations to an arboreal locomotor pattern that is more tentative—less headlong—than those of typical terrestrial quadrupeds or most arboreal nonprimates. We suggest that this is part of a set of basal ordinal adaptations for moving and foraging on fine branches. As noted earlier, DS walking gaits lose many of their comparative disadvantages as support width approaches zero. They seem correspondingly likely to have evolved in animals that moved on supports that were thin relative to the dimensions of the animals' body—in other words, in a fine-branch milieu. But such a milieu implies no intrinsic advantage for DS over LS walking. The only such advantages we have been able to identify involve a reliance on grasping hindfeet for security in the trees. Such security is enhanced by increasing hindlimb duty-factors. Increases in hindlimb duty-factors relative to those of the forelimb also automatically increase diagonality. As soon as diagonality surpasses 50, the animal enters the part of the Hildebrand space where it can balance on a protracted hindlimb before putting any weight on an untested forelimb support. This is advantageous for arboreal animals with grasping hindlimbs that are able to grab the support behind if the one ahead fails. The tempo of the animal's gait is also relevant to the utility of the grasping hindlimb in quadrupedal locomotion. The security of the hindlimb support point is of little consequence to an animal that bounds along branches like a squirrel or a tree shrew, using mainly asymmetrical gaits and moving too rapidly to be able to stop if the branch ahead bends or breaks. It is accordingly not surprising that the infrequent symmetrical arboreal walking gaits of Tupaia are diagonal-couplets walks in lateral sequence (Hildebrand, 1967; Jenkins, 1974). To enter the adaptive zone where DS gaits make a difference, an animal has to have grasping specializations of the hindfeet and relatively deliberate locomotor habits. A tendency of the body to pitch backward at the moment of forefoot touchdown may be advantageous in this context, and can best be achieved by using a diagonal-couplets, diagonal-sequence gait. We conclude that the general preference of primates for DS gaits reflects an ancestral adaptation to careful or controlled locomotion in a fine-branch setting, where the characteristic primate specializations of the hindfoot function to enhance security and stability. There are two kinds of natural experiments that we might look to test this conclusion. First, we can look at walking patterns in primates that have reduced the grasping specializations of the hindfoot and reevolved a claw-based locomotion on large supports. We might expect such animals to revert to LS walking gaits. Recent studies of Callithrix jacchus support this contention (Cartmill et al., 2002; Schmitt, 2002, 2003). These marmosets are small-bodied primates with reduced halluces and claws on their other digits. They have the sharpest claws of any callitrichid (Hamrick, 1998), and spend more time clinging to and feeding on large, vertical supports than other callitrichids do (Garber, 1992). Studies of three male C. jacobus show that their infrequent walks are exclusively lateral-sequence gaits, plotting with nonprimate walks on the Hildebrand diagram (Cartmill et al., 2002; Schmitt, 2002, 2003). Other callitrichids—Leontopithecus rosalia, Callimico goeldii, and Saguinus midas—exhibit DS walking gaits (Rosenberger and Stafford, 1994; Schmitt, 2002, 2003). These facts support the association we posit between DS gaits, reliance on pedal grasp, and a preference for narrow supports. The second test we can run involves looking at nonprimate mammals that resemble the hypothetical ancestral primate in the respects specified by the theory. If they have not moved in evolutionary directions parallel to those of primates, then the theory is defective or incomplete. For this second comparison, the appropriate animals to look at are small marsupials like Caluromys. As noted by Lemelin and Schmitt elsewhere in this volume (Chapter 10), woolly opossums have grasping hindfeet similar in proportions and grasping abilities to those of prosimians, and move around in fine branches foraging for fruit and insects. We might therefore predict that woolly opossums too would have DS walking gaits, especially when walking on thin poles. Our data confirm this prediction (Figure 10). By contrast, the terrestrial didelphid Monodelphis exhibits mainly LS walking gaits. Like Callithrix, Monodelphis has probably reverted to LS gaits secondarily as a result of giving up an arboreal habitus, in which DS gaits have an adaptive advantage. The interspecific scatter of didelphid walks plotted in Figure 10 passes roughly through the intersection of the trot line (D = 50) with the Hildebrand plane, and does not evince the shift to the right seen in the primate scatter (Figure 8). This is probably not a real difference between primates and didelphids. A more detailed examination of our intraspecific data for Caluromys shows that its walking gaits on a 7-mm pole are significantly right-shifted compared to its walking gaits on a flat surface—that is, they have higher diagonalities for a given value of the duty factor index (Lemelin et al., 2003). It remains to be determined whether a similar rightward shift can be detected in gait data for primates walking on arboreal versus terrestrial supports. Figure 10. 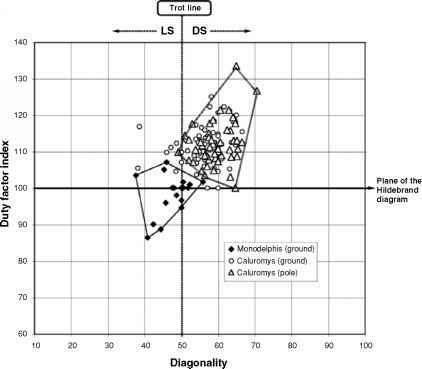 Diagonality plotted against the duty factor index (100 x hind/fore duty-factor) for walking gaits of the didelphid marsupials Caluromys philander (open symbols) and Monodelphis brevicaudata (black diamonds). Minimal convex polygons are shown for the Monodelphis scatter (solid polygon) and for walking gaits of Caluromys on a 7-mm-diameter pole (dotted polygon). Data from Lemelin et al. (2003). (cf. Figure 8).